The tourism activity emanating from mass visits of sacred sites by the followers of a religion can be defined as “Faith (Belief) Tourism.” Efforts were launched to promote faith tourism and the first such tours began in 1995. A large number of foreign tour operators, members of the press and experts met in a variety of faith tours organized between 1995 and 1998. There is a myriad of important Islamic, Christian and Jewish sites scattered all around Turkey, making Anatolia, Turkey an attractive destination for faith tourism. Some of these sites that you can explore by TransAnatolie Tour Belief Tour programs are in the sequel. İstanbul. This is one of the most important cities for both Muslims and Christians. İstanbul is a world center that can shed light on studies of religious concepts and the sociology of religion. St. Sophia and Sultan Ahmet Mosque, two examples of the most prominent architectural masterpieces of the world, as well as the Greek Orthodox Patriarchate, one of the most important and influential bodies of Orthodoxy, are also in İstanbul. Konya. The tomb of the great Mevlana Celaleddin Rumi, the world-famous humanitarian, philosopher and mystic-poet, is located in Konya. Eşrefoğlu Mosque in Beyşehir is the largest and the most original mosque in Anatolia using timber as supports. Edirne. Selimiye Mosque, built by the Master Architect Sinan when he was 80 years old, is one of the masterpieces of Turkish-Ottoman art and the history of architecture. Edirne is a notable religious center with the Bayezid II Mosque, the Old Mosque, the three Balconied (Üç Şerefeli) Mosque and many other religious monuments. Bitlis-Ahlat Tombs. The monumental tombs known as “kümbet” are considered primary examples of Seljuk architecture which are still intact. Some of the important ones are the Ulu (Grand), Hüseyin Timur, Buğatay Ata, Sultan Hasan, Maid Erzan, Emir Bayındır and the Monk tombs. Kars-Hasan Harakâni Tomb. The owner of the famous words “Feed all who knock on this door and never ask them their faith”, Ebu’l Hasan Harakâni came to Anatolia with Çağrı Bey and was martyred near the Kars Citadel. His tomb and the Evliya Mosque Complex are in Kars. 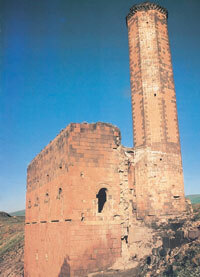 The first mosque the Seljuk Turks built in Anatolia is in Ani, near Kars. Bursa. 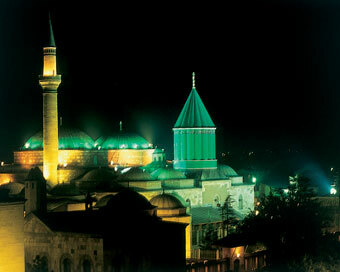 The Green Mosque and Tomb and the Grand Mosque, the most classical and a monumental example of multi-domed mosques, as well as a number of other religious works including the Muradiye and Yıldırım Beyazıt Mosque complexes and the Sultan Emir Mosque are located in this former Ottoman capital. İznik. Eight ecumenical councils of early Christianity were held in today’s Turkey. İznik hosted the First and Seventh Ecumenical Councils in St. Sophia and the Council Palace. Şanlıurfa. Known as the “City of Prophets”, Şanlıurfa houses the Fish (Balıklı) Pool, the cave where the Prophet Abraham was born, the tomb of the Prophet Job and other religious sites such as the town of Shuayib. Harran. This small town in a fertile land is mentioned in the Holy Books and it is one of the focal points of faith tourism in Turkey. According to the Holy Books, the Prophet Abraham rested here while he was on his way to the south and Terah, the father of the Prophet Abraham, died here. Içel-Tarsus. This is the place where St. Paul was born. The St. Paul Church and the St. Paul Well are located in Tarsus, too. 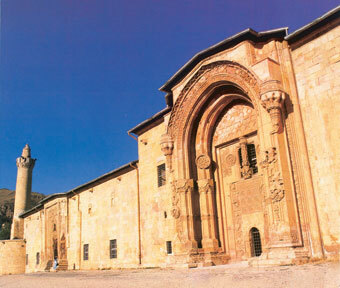 In addition, the St. Thecla Church, the Olba Temple Church, the Church of the Virgin Mary and the Alahan Monastery are in the province of İçel. Manisa-Thyatira (Akhisar) Church. The remains and bricks in the city show that there used to be a church in this pretty little town. This is one of the Seven Churches of Revelation referred to in the Bible. Its name means “holding strongly” or “constant sacrifice”. The Philadelphia (Alaşehir) Church. This is also one of the Seven Churches of Revelation mentioned in the Bible. Its name means, “that remains” and “walk with me”. Hatay-Antakya. According to tradition, the “St. Matthew Gospel” was written in Antakya (ancient Antioch-on-the-Orontes). It was in Antakya that the followers of Jesus Christ were called Christians for the first time. It is believed that St. Paul made three journeys, all starting out from Antakya, to introduce the Bible to the pagans. Antioch is the second most important city for Christians for St. John Chysostom was a native of this city, the Holy Book School was located here and the Church of St. Peter, one of the first churches of early Christianity was located on the outskirts of the city. The Church of St. Peter (The St. Peter Monument Museum). This is one of the first churches in the world. It was here at this church that the followers of Jesus were called Christians for the first time. Pope Paul VI declared this church a site of religious pilgrimage in 1963. Every year the Catholic Church holds a special ceremony here on June 29. In addition, the St. Simeon Stylites Monastery and the remnants of the port city of Seleucia from where St. Paul sailed on his evangelising mission are near this grotto church. İzmir-Selçuk: The House of Virgin Mary. The House of Virgin Mary is situated on Bülbül (Nightingale) Mountain at an altitude of 420 meters and 9 kilometers away from Selçuk. The church here is believed to have been built in the fourth century. This is a sacred site both for Muslims and Christians. The Papacy declared this place a sacred site for Christians in 1967 and a ceremony is held here on the first Sunday following August 15 of each year. Furthermore, the St. John Basilica and three of the Seven Churches of Revelation (Smyrna, Pergamum and Ephesus) are also located in the vicinity of İzmir. Nevşehir-Cappadocia. Cappadocia is probably one of the most important places where St. Paul travelled during his 30 years of missionary journeys. It was here that St. Paul established the first churches. Cappadocia is one of Turkey’s prime attractions with natural rock formations, numerous churches carved into soft rock and splendid frescoes on the walls of these churches. 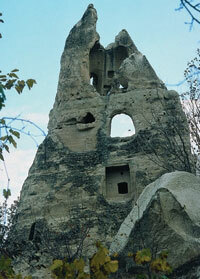 There are more than 2,200 troglodyte churches in Göreme Valley, Zelve, Çavuşin, Ortahisar, İbrahimpaşa, Mustafapaşa, Yeşilöz and Akçasaray. Derinkuyu Orthodox Church. According to the inscription on the western portal, this church was dedicated to St. Theodoros Trion. It was built in 1858 during the reign of Sultan Abdulmejid (1839-1861) by the master architect Kyriaco Papadopoulos of Haldias with the encouragement of Konya Metropolitan Neofitos and the financial contri-butions of the people of Malakpoi. Isparta-Yalvaç. The St. Paul Church in ancient Pisidian Antioch is one of the first Christian churches in the world. St. Paul arrived here in 46 A.D. with St. Barnabas and delivered his first sermon in the syna-gogue of this ancient city. Later on, the St. PaulChurch was built over the founda-tions of this synagogue. Antalya. Antalya is mentioned in the Bible as another city visited by St. Paul. Antalya-Demre. St. Nicholas, Bishop of Myra, is generally known as Santa Claus or Father Christmas in the Christian world. 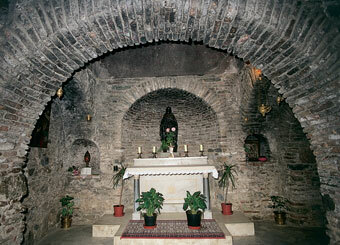 St. Nicholas lived and died in Demre where a church was consecrated in his memory in the sixth century. The International Santa Claus Festival in Demre and Kaş takes place between December 6 and 8 every year and has become a traditional event. 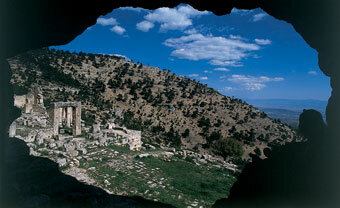 in 380 A.D. One of the Seven Churches of Revelation mentioned in the Bible was located here. Balıkesir-Ayvalık-Taxiyarhis & St. Nicholas Churches. The Taxiyarhis Church, decorated with Biblical scenes from the Old and New Testaments, is visited as a sacred site by Orthodox Christians. In addition to the sites already mentioned, the Hacı Bayram Mosque and Tomb in Ankara; the Veysel Karani and İbrahim Hakkı tombs in Siirt, the Grand (Ulu) Mosque in Sivas; the Yunus Emre Tomb in Eskişehir; the Dayr-ul Zaferan Monastery in Mardin; the Twin Minaret Madrasah in Erzurum; the Sumela Monastery in Trabzon; the Akdamar Island and Church as well as the Çarpanak Churches in Van; Deyle, Derbe and the Thousand and One Churches in Karaman; Ani ruins in Kars and the Great Ağrı Mountain are among the myriad of sites which make Turkey an excellent destination for faith tourism.